Training Methods Used to Develop Endurance in Sport. Throughout all phases of development, especially the phase of perfecting endurance, the body’s adjustment to physiological limitations of endurance training is crucial. Physiological limitations (i.e., tissue adaptation to work under the conditions of insufficient O2, hypoxia, an excess of carbon dioxide) are always accentuated when the athletes reach a high stale of fatigue. In order to further the body’s adaptation to a higher endurance demand, in addition to classical methods which briefly will be described below, other techniques may also be considered. Breathing at a lower rate than the body and rhythm of performance demands may artificially create a state of hipoxia (i.e., to breath once at every 3-4 swimming strokes). Training at a medium or high altitude, which many East European athletes do twice a year for 2-4 weeks, where the partial pressure of O2 is lower, also leads to the same result, that is to train under the conditions of hypoxia. Another positive result of employing the above two techniques is the increase of hemoglobin content of blood. Hemoglobin is an iron-containing protein pigment present in the red blood cell, functioning primarily in the transport of O2 from the lungs to the muscle tissue. One of the characteristics of all training methods incorporated in this category is the fact that work is not interrupted by rest intervals. The most commonly used methods are as follows: a. uniform or steady state, b. the alternative, and c. the fartlek method. THE UNIFORM METHOD is characterized by a high volume of work without any interruptions. Although it is used throughout all annual training phases, this method is dominant during the preparatory phase. It is highly recommended for most sports requiring aerobic endurance, but mostly for cyclic sports of which the duration is 60 seconds or more. The duration of one training lesson may be between 1-23 hours. The intensity may be properly calculated by employing the heart rate method, and it is suggested to be between 150-170 bpm. The main training effect is the improvement and perfection of aerobic capacity. Similarly, the steadiness of performance leads to a consolidation of technique (i.e., Speed skating, swimming, canoeing, rowing) while the working efficiencies of the body’s functions are improved. A variant of this method is the progressive increase of speed from a moderate to a medium intensity throughout a training lesson. For instance, the athlete may perform the first one-third of the training distance at a moderate speed, increasing it to a intermediate, and finally to a medium intensity for the last one-third. This progressive elevation challenges the athlete both physically and psychologically, thus being considered an effective method of developing aerobic endurance. THE ALTERNATIVE METHOD is considered as one of the most effective methods of developing endurance. Throughout the lesson, the athlete changes the intensity of performance over a predetermined distance. The intensity of work varies frequently from moderate to sub-maximum without any interruptions. These variations of intensities may be determined by external factors such as terraine profile (for running, cross-country skiing and cycling) or by internal (athlete’s will) or planned factors (coach’s decision regarding portions of distance to alter the intensity). The peak velocity of a duration between 1-10 minutes ought to be alternated with moderate intensity, which will allow the body to recuperate slightly prior to another increase. For high velocity stimuli the heart rate may leach values around 180 bpm while the restoration phase may have the rate around 140 bpm (Pfeifer, 1982), but not much lower than that. The rhythmical, wave-like approach in altering the intensity facilitates a high volume of work, where the cardio-respinatory and CNS capacity improves significantly. In addition, this method promotes a flexible adaptation of the body’s processes resulting in a strong development of general endurance. This method may be applied not only by those involved in cyclic sports (precompetitive, and competitive phase), but also by others (team sports, wrestling, boxing) during the preparatory, and precompetitive phase. A meritous variant of this method is the organization of the entire training program into sets. Instead of performing an uninterrupted work of, say, 90 minutes, it may be divided into three sets, having an active rest (i.e., walk) in between each set. THE FARTLEK, or speed play, method was developed by the Scandinavian and German runners in 1920-1930. While performing it, the athlete inputs his/her own contribution in the sense that uniform training is alternated at will with short portions of higher intensity performance. Such sprints are not planned, and rely mostly on the athlete’s subjective feeling and judgment The use of the fartlek method is specific mostly, but not entirely, to the preparatory phase, as a variety inflicted in the monotony of uniform training. The term interval training does not necessarily refer to a well-known method, but rather to all methods performed with a rest interval (figure 106). THE REPETITION METHOD of distances longer or shorter than the racing distance develops specific, or racing endurance. 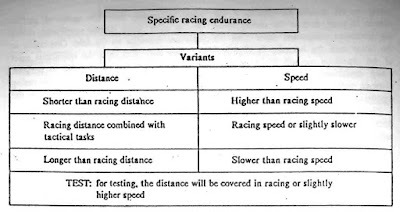 Longer repetitions place a strong demand on the aerobic component of the racing endurance, since the speed of performance is very close to the racing speed. On the other hand, shorter repetitions solicit the anaerobic component since often the performer develops an O2 debt. Obviously in the latter case the intensity is slightly higher than that of a race. An important asset of the repetition method is the development of willpower via the demand to perform many repetitions. The total volume of work may be 4-8 times that of the racing distance with a rest interval which might be between 5-10 minutes depending on the repetition distance and intensity. MODEL TRAINING may be considered as a variation of repetition training since an athlete is exposed to repeating several training distances. However, the originality of this method lies in the fact that it resembles the specifics of the race, thus the name model training. Therefore, the first part of training is composed of several repetitions much shorter than the racing distance. In addition to the shorter distance one performs an intensity close to (slightly higher or lower) racing velocity. Under such conditions the energy is provided by the anaerobic metabolic system, as is the case in a race. The mid part of training has to use distances and intensities which serve to improve and perfect the aerobic endurance. 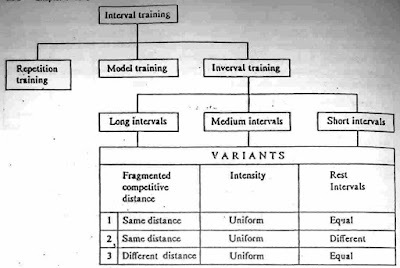 In order to exactly model the race, the last part of training employs once again short distance repetitions, which resemble and develop the final kick capacity. Such repetitions are performed under a certain level of fatigue (as in the race) and heavily tax again the anaerobic endurance (which, considering its specifics may be called speed of endurance). Factors like total volume of work, velocity, rest intervals, and the number of repetitions, have to be calculated according to the individual’s potential and the characteristics of the sport. The heart rate method may be employed for the calculation of the rest interval. Considering its specificity, this method has to be employed during the precompetitive, and competitive phases. INTERVAL TRAINING, a method which was in fashion in Europe in the 1960’s and over-rated in North America even in the 1980’s, is rightly reconsidered for its merits of the development of endurance. Most of the exaggerations as far as interval training is concerned came from the fact that repetitions of short durations were expected to improve everything, including aerobic endurance. And obviously this never was the case. In fact there is no one method which can do everything for everybody. Only a wise combination of all methods knitted together according to the needs of the athletes and the specifics of the sport, may be successful. Interval training, as it is best known (duration of stimuli between 30-90 seconds), inadequately develops the aerobic energy production system, as well as the capacity to maintain what development there is throughout the competitive phase. Interval training refers to the method of repeating stimuli of various intensities with a previously planned rest interval, during which the athlete does not fully regenerate. The duration of the rest interval is basically calculated by the heart rate method. The portions of distance to be repeated could be performed either by time (i.e., 12 x 3 minutes) or precise distance (12 x 800 m). For a more efficient training effect, all three interval training methods should be combined. The short distance interval training, between 15 seconds-2 minutes, which mostly develops anaerobic endurance. 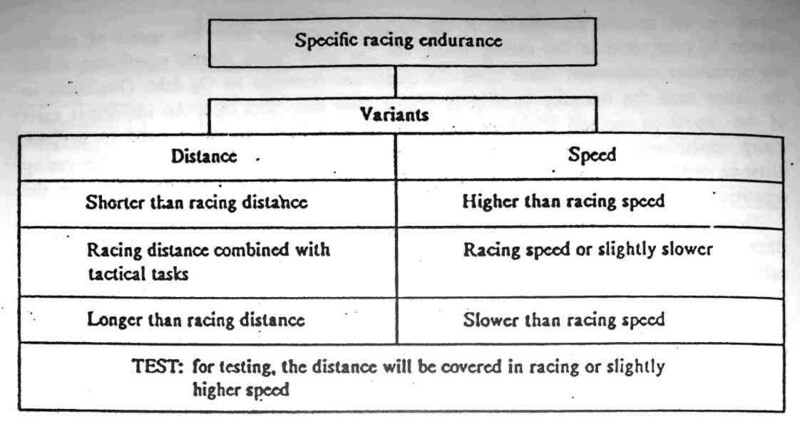 The development of very specific endurance is realised by what Pfeifer (1982) calls “control, or facing method.” As the term suggests the employment of such a method develops exclusively the endurance specific for each event/sport. 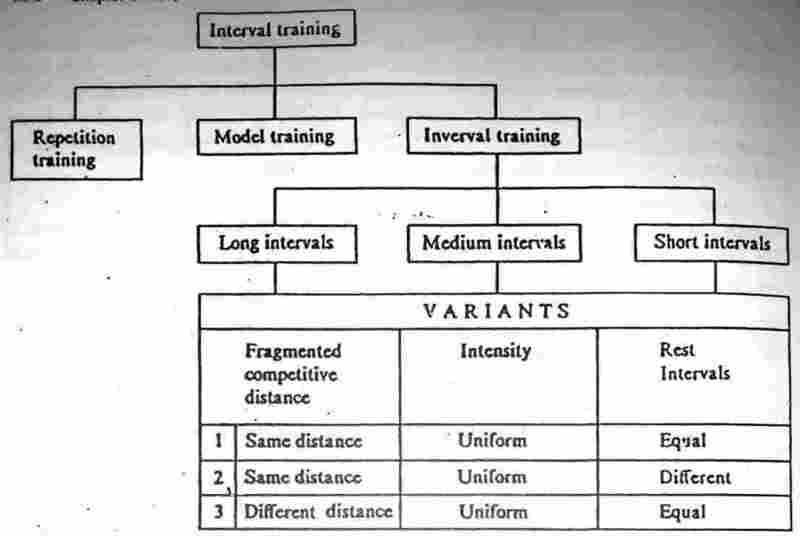 The training dosage ought to be calculated in such a way that it corresponds specifically to physical, psychological and tactical characteristics of the selected sport (figure 107). The development of endurance is a complex task, since in most sports there are combinations of both aerobic and anaerobic components. Consequently, in order to achieve a complex body adaptation several of the above methods and variants have to be used. But the physiological effect of a method does not have to be the only criteria of selecting a training method, there is also the psychological benefit of a method. Apparently, from a psychological point of view, training methods aiming at developing aerobic endurance (uniform and alternative) are superior to interval training (Pfeifer. 1982).